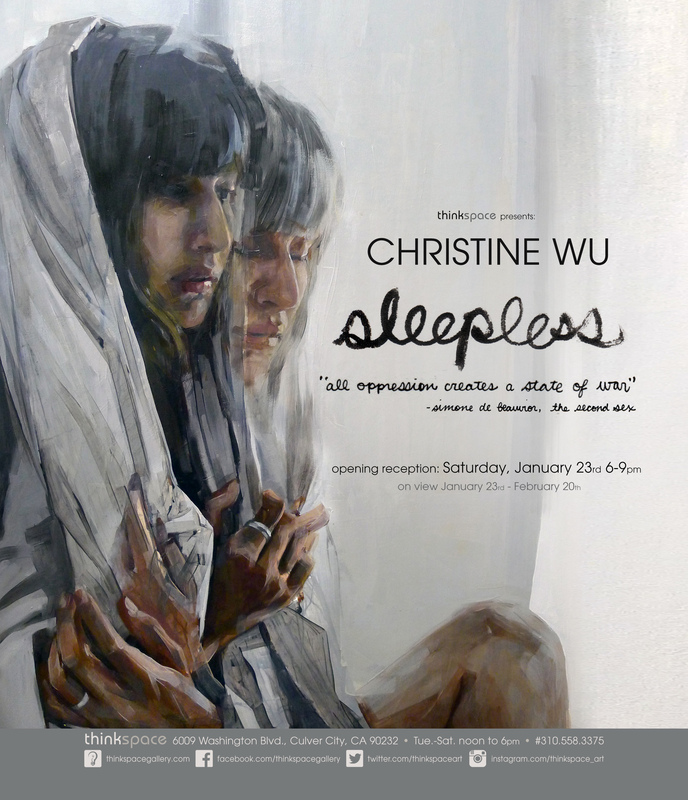 (Los Angeles) – Thinkspace is pleased to present Sleepless, the gallery’s first major solo exhibition of new works by New York City-based painter Christine Wu. A figurative oil painter who explores the expressive and emotive possibilities of the body, Wu delves into the vulnerability of self and the haunted nature of human consciousness. Her evocative and sensual depictions explore themes such as nostalgia and metaphysical becoming, expressing ephemeral states through physical manifestations of subjectivity. Wu incorporates abstract gestures into her works, often dissolving edges and contours to conflate environments and disrupt the representation of bodies, splintering and splitting the cohesion of an illusory whole in favor of a more experientially realistic incoherence. These moments of abstraction, however, are always in service of form and figure. Wu is fascinated by the cyclical momentum of growth and decay, and by the literal and metaphoric complicity of life and death. Her paintings capture this ambivalence, revealing the ghostly remnants of a divided subject through symbolic figurative instability, redoubling and flux. Wu is interested in memory as a subjective construct; a mutable and fractured consciousness that is defined by sensorial experience and recall. Stylistically, she expresses this intangible feeling of disjointedness through multiple vantage points, or moments, captured in a single temporal frame, not unlike double-exposure photography. This unhinging of linear time captures the conflict of divisive psychological states. As the title of the exhibition suggests, Sleepless invokes the disturbances of night, both real and imagined, and the suspended unrest or “world-weariness,” in the artist’s own words, that arrests the subject’s release into sleep. As with previous works, Wu’s new paintings are sensual corporeal excavations of a vulnerable and imperfect self, grappling with the interminable process of self-realization. Known for her subtle tonal palettes, and exquisitely precise line work, Wu’s new works are darker and more muted than her previous. This aesthetic shift is Intended to capture a feeling of isolation and emotional strain, in keeping with the exhibition’s theme of nocturnal restlessness. 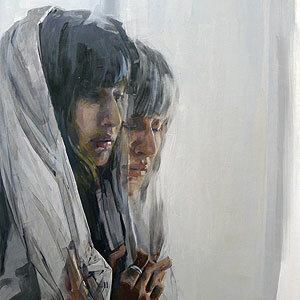 Her subjects are women created from a woman’s perspective; conflicted, complex, sensual, wounded and ambivalent, rather than reductively fetishized. Wu is in search of raw emotional experience rather than caricature, expressed through the vicissitudes of the physical body. Formally, the new works explore texture and tactility in new ways, inciting a physical reaction and desire to touch, a desire offset by its implicit prohibition. In Sleepless, Wu continues to stage these tensions between the intimate and private, the public and exposed. There is a quiet and understated, though undeniable, intensity to the glimpses of interior life the artist selectively reveals. Through her unique take on figurative expressionism, Wu’s visceral paintings remind us of the fragility, and resilience, of the human psyche, and of the unavoidable erosion and deterioration of all external and impermanent things. Wu’s splintered bodies in breach seem to suggest that the individual’s personal growth is inextricably bound to a series of imposed and elective deaths; a constant process of undoing and becoming, remembering and forgetting.